Minimum quantity for "Forex flex" is 1. -Settings Guide Version 4.5+ and Change Note. -Strategies And BEST Currency Pairs. -Added IndicatorDataReset=false; //Reset virtual data if indicators aren’t ready and accuracy is above 100%. This was turned on by default in 4.64 which reduced trading frequency quite a bit for strategies that use both virtual trades and some indicators. – Added some external multipliers for the ADRDynamic strategy to allow you to configure how it calculates the settings for this strategy instead of static internal multipliers. – Added CloseBasketAfterXmins which will close all trades for that pair after ‘x’ number of minutes that it has been opened. – Virtual Data is now reset if it gets over 100% but the indicator filters you have turned on are not met. – Increased pause while trades are being closed to prevent anymore from being opened during this time. – Fixed an issue where the Friday close wasn’t pausing long enough to make it to the weekend allowing the possibility of more Friday trades to slip through. – Change how TDI, TDI Cross and TDI Slope are used. They will now buy when tdi slope is moving up, tdi crossess up, etc instead of requiring ReverseMode to be on like in previous versions. – Added GUI buttons on chart which can be dragged to any location you want. -Clicking the ON/OFF button will turn Flex off on that chart only, but if that chart has open charts it will continue to manage them even if you set this off. -Clicking CLOSE will bring up a similar box asking to confirm you want to close all open orders for that pair only. -Clicking the CLOSE ALL button will bring up the following popup box asking to confirm you want to close ALL Flex open trades with that magic number. – Added FullBasketEquityTrail, when turned on it will allow Flex to start an EquityTrail at a defined loss pct (WhenToStart_FBET) for a full basket (reached max trades). This can be useful if you want to try to get out of a full basket as quickly as possible even if it means at a loss. It will only kick in if you have a max trade basket, and it’s DD comes back above the (WhenToStart_FBET) value. – Added a failover authentication check from a 2nd server if the first (forexflexea.com) fails if it’s down or unreachable for whatever reason. -Fixed an issue with Hedging where if the basket closed but the Hedge didn’t, another Hedge could be opened against that Hedge trade. 1. Added a pipstep for the Hedge trade to choose when to place it instead of immediately after the last trade in a basket. 8. Added a DynamicAdditional setting which will require any indicator filters used for entries to be used for additional trades in a basket. 9. Added a WaitForNext bar setting that will wait for the current bar to close before entering a trade if one is ready to open. 10. Added a CheckCandleSize to only trade if one of the previous 3 candles is large than ‘x’ number of pips. -Adjusted EquityTrailSL so if you enter a value greater than 0.0 it will use that SL instead of auto calculating one based on your EquityTrailTP and EquityStep. -Added an OffSetHour for the news filter incase your news is a few hours ahead or behind. -Fixed FFCal.ex4 news indicator to stop it spamming error 5004 even though it wasn’t affecting trading in anyway. PrecisionNew market monitoring virtual trade technology brings precision entry points that no indicator can compete with. The default settings will use 6 virtual trades per currency pair to monitor market conditions. Lowering this number will result in less accurate entry points, but higher trading frequency. Raising this number will do the opposite. When the market shifts, this is the one of the main settings we end up changing. If and when that happens, we will send out automatic update notices to everyone so you're never left behind. 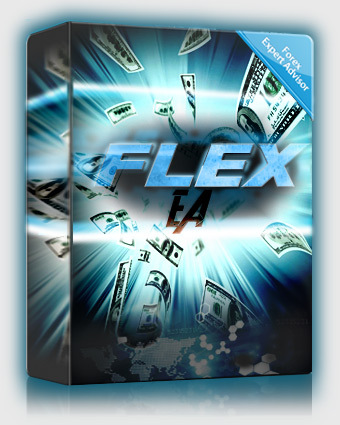 FlexibilityFlex EA can be setup to trade just about any trading strategy imaginable. All 3 memberships will include all 12 different setting configurations that offer 12 unique trading strategies that you can plug and play at the click of a mouse.